I like to think that the night of New Year is a reflection of how the following months will pan out. Not everyone loves Hogmannay, so I realise that this is perhaps a personal myth. However, if we take that idea and run with it, many of us had a white and snow-covered start to the year and fashion in 2011 is definitely going to reflect that. White is the colour or the non-colour for any purists out there. Well, pure are what we’re going to need to be, many of the collections for Spring Summer this year, featured top to toe in white. Hmm. This. Is. Not. Good. Don’t get me wrong, I love white: it’s Summery, fresh and angelic – a look I sometimes struggle to achieve. The problem is that UK summers aren’t usually very balmy; in fact, they’re notoriously wet. Rain equals dirt. And the snowy attire that graced the catwalks was definitely not mud splattered. Shame. And don’t get me started about white jeans. TV programme ‘The Only Way is Essex’ was a surprise hit but I’m hopeful that denim, Dagenham style, isn’t going to find it’s way into this years trend. Frankly, white jeans are impossible to get right. They rarely look classy, are totally impractical and unforgiving on even the skinniest of whippets. So, how should us mere mortals carry off this trend: to look, well… heavenly? You know I love a bargain, so a great idea is to combine some of the trends that are going to be big this year (but from experience, don’t try and do them all at once!). Personally, I’m loving white lace and anything sheer and floaty. For me it also has to be short, I can’t abide dirty bottoms. Of my trousers, obviously. It may seem innocuous but lining is just as important as the outer fabric when gowning up in white. You don’t want your undies to show through, unless of course that’s the look you’re going for: cute cami – yes, black g-string – hell, no. This ain’t the 90’s after all. list. 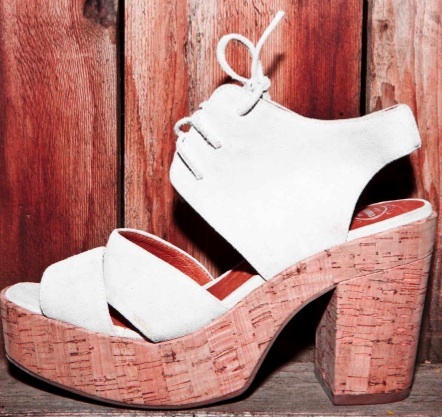 With the whole 70’s vibe going on, I expect wooden soled platforms with a splash of white to be a good combo-trend choice. Perhaps worryingly, white eyeliner is also ‘in’. Not sure about this one, unless it’s worn on the inner rim to make eyes look bigger. Mixing different shades of white and off-white, tones and textures is also a big hit, or give an outfit a bit of punch with some of the other big Summer colours like burnt orange, navy and jewel hues. And if you’re wondering, I was at a wedding this New Year. Don’t think I’ll be taking the white trend that far though…!